I was coasting along the TV offerings while folding some laundry the other day and came across a Dr. Phil show entitled "Brat-proof your child!" I figure this was an episode I could sit through. Surely at some point I will need to brat-proof my children. Better study up now. There were numerous home videos of children pitching a fit at home, in store aisles, at parks, all for this, that, or the other thing. And then the dejected parents would walk out on stage and claim they've tried everything! Their kids are just out of control! What really got my attention? The behavior of the kids on TV was oddly familiar! (this is where I gasped rather loudly) The tantrums! The fighting! The talking back! Had I closed my eyes, I wouldn't have been able to tell if those were the ear searing screamings of someone else's cranky child or my own! I may have brats! So after the hour long peptalk from Dr. Phil and his "expert" guest. I felt like I had tools to fight off the brats. Even though some of the suggestions to stoop down to their level and "acknowledge their feelings" did send an eyeroll or two from my direction. I did, at the end of it, feel like I needed to change my game. Obviously I wasn't doing things right. Because my kids melt down in Target, and tell me to "stop talking, Mama!" all the time. So there we are in the middle of a park with ten thousand other children to see some manufactured snow. I had envisioned a blower tossing out some crystallized water as the kiddos squeal with delight, basking in the magic of the season. (and advanced technology to make snow in the desert's 65 degree weather) What I beheld after the long walk from our car in "special event parking" to the actual park was a 2x2 patch of "snow" and those measurements were being generous. (Additionally surprising was how many people out here own a snow sled! It's way too many in my estimation!) I kept telling myself "You promised snow! The kids are going to freak out if they don't play in some snow!" I decided to implement all the Dr. Phil teachings. It was time to roll up my sleeves and do some brat-proofing.In the end, there were tantrums. Because, as it turns out, I am not willing to wait in a line that looks like a Wal Mart parking lot at 4am on black Friday. And three year olds are pretty adamant about playing in snow. With some trusty friends, we waited in the smaller, yet still significantly long "santa line" and then the "pet the reindeer line." At the end of the afternoon, I had to put two screaming and kicking preschoolers under my arm to make the long trek back to the car. I had failed. No amount of "understanding" and "tools" were going to cause my girls to magically be ok with leaving a park full of santas, reindeer, and the ever elusive snow. As the hoards of people just like me gave up on the lame snow park and trudged along with their children in tow towards their vehicles, I heard a little boy behind screaming and hanging off his mother raving about not wanting to leave. So I didn't feel too bad. I may have brats, but at least I'm not alone. The other mother's eyes met mine and we gave each other a knowing nod. Fun times. Hurry up and take your picture! 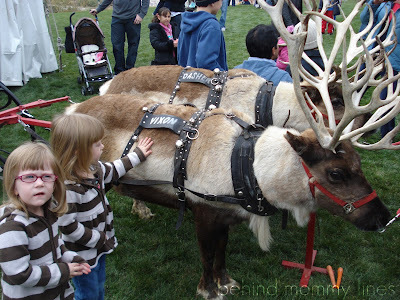 There's four hundred other little boys and girls who want to "pet" the reindeer too! The real losers of the day? Totally the reindeer. Strapped to a fake sleigh, flanked on both sides by never ending lines of grubby, grabby, and anxious children. That must be some kind of special reindeer hell. I desperately wanted to release them from their harnesses and let them run free... like a Free Willy kind of moment. So what were these tools? ahhhahaha I was WAITING for the post about the park- the snow was a BUST! and guess what- my kid was TERRIBLE like 50 times worse than your two combined- I even told Michelle that my kid was worse than her three- it was bad. yeah the snow was umm seriously what WAS that? and hailyn FREAKED when she didnt get to see reindeer right away- and half the other moms were in the same boat- kids melting down. it was ridiculous. Seriously ridiculous. We need another hangout session asap- maybe monday if I can steal ryans car!!! mine will be in the shop- good times! ahhh I LOVE the way you described the situation- it wa a winter wonderNOT land! seriously!